This came out exactly as I had hoped. Yeah! Watercolored the edge of a watercolor paper panel with a combination of Kuretake Gansai Tambi watercolors and some ink from a Tombow marker. 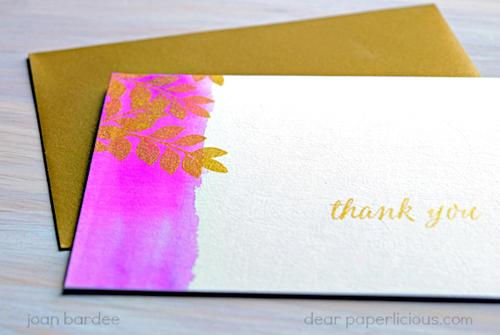 Stamped a leaf from Hero Arts For You Flowers Color Layering set and a sentiment from Hero Arts Color Layering Bouquet with Delicata Golden Glitz ink. Adhered the watercolored panel to an A2 card. So clean and simple, and gorgeous. 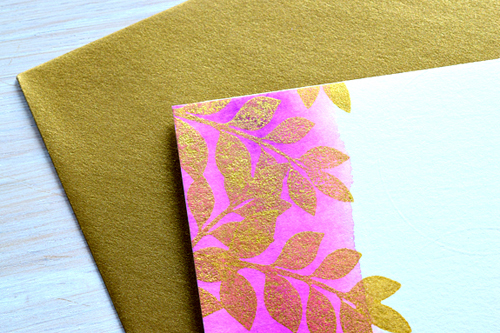 I love the gold embossing against that bright pink. Oh my - golden deliciousness! this is so pretty Joan - the swash of pink with the gold is fantastic! Just bought Deli Gold & Silver...thinking about Christmas. Now I can think about pretty metal all year long. What a pretty card! It's perfect and so elegant! 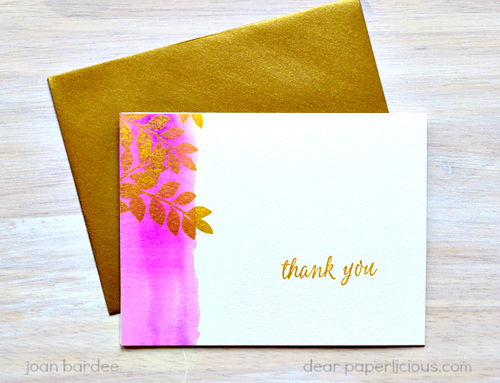 The gold ink looks fantastic on the rich pink. Beautiful! OH Joan! I just love this card, and was soooo excited to find it in my mailbox!! The colors are fantastic and the way the the gold shimmers ever so slightly is perfection! Thank you, thank you! !